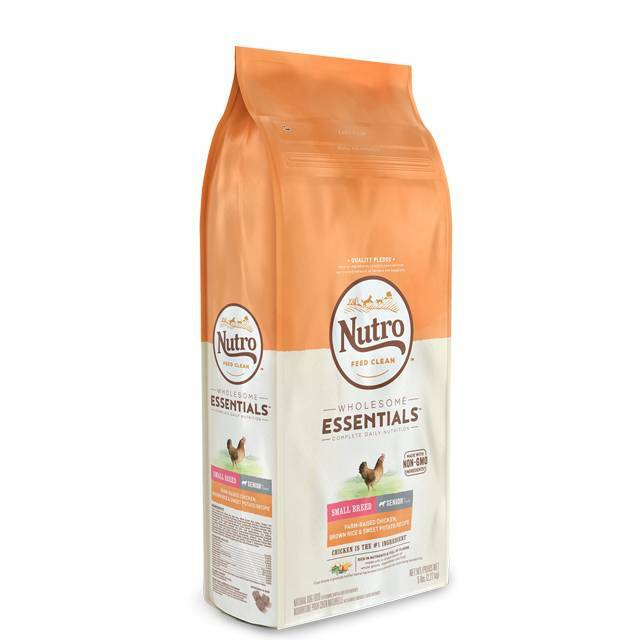 Home » Nutro Wholesome Essentials - Chicken Senior Small Breed 5 lb. Nutro Wholesome Essentials - Chicken Senior Small Breed 5 lb. NUTRO™ WHOLESOME ESSENTIALS™ Small Breed Senior Farm-Raised Chicken, Brown Rice & Sweet Potato Recipe Dog Food always starts with great-tasting, farm-raised chicken and contains a unique blend of whole grains, vegetables and fruit. This natural dog food provides tailored nutrition for your small breed's unique needs and is crafted to help maintain cognitive health, plus vitamins, minerals and other nutrients. These recipes also contain essential antioxidants to support your dog's aging immune system. NUTRO™ Food for Dogs follows the THE NUTRO FEED CLEAN™ philosophy, is always made with Non-GMO Ingredients and is made with no artificial flavors, colors or preservatives.